Instead of enjoying Wasamin’s Wednesday evening event, I was home starting this report. Why? Because the Kawasaki event was cancelled due to the incoming typhoon. 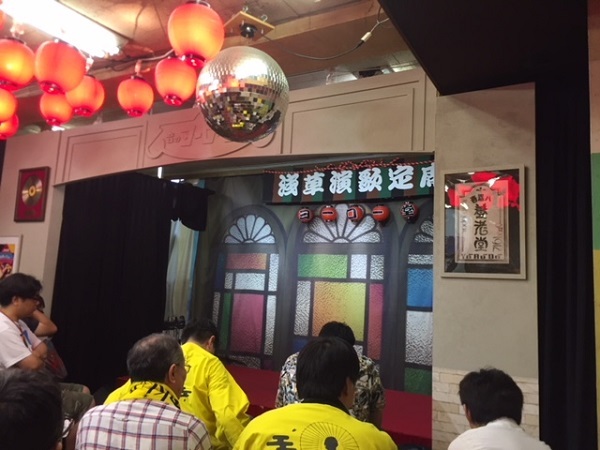 Wasamin did perform at the matinee event in Asakusa earlier on Wednesday, which I attended. 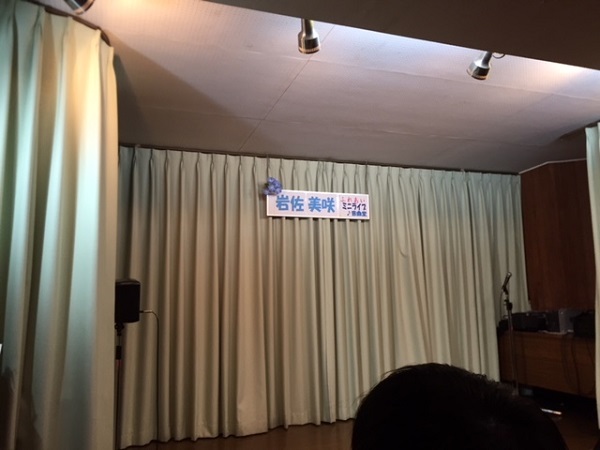 She also did a furage event in Saitama Prefecture Tuesday night. The only other time I recall Wasamin ever cancelling a singing event was back in 2014 following the Iwate Incident. Anyway, Wasamin reassured fans Thursday’s events were still on, but we should all just stay safe and dry Wednesday evening, which was probably for the best since the eye of the storm passed over Tokyo right around the time the event would have ended. 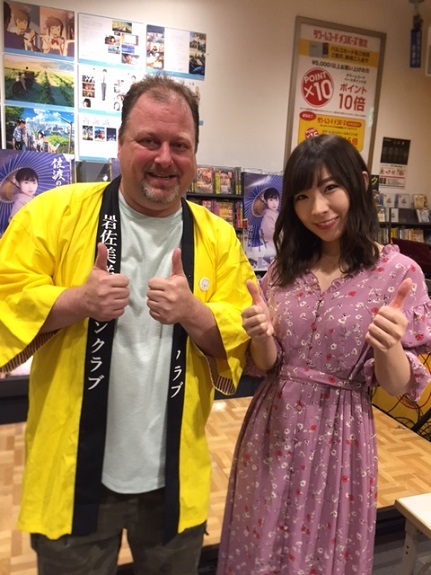 After the 2-shot I confirmed with Wasamin the original singer on Tegami (one of the B-sides) is Yuki Saori, at which point I told her that Yuki-san is in one of my favorite NHK Asadora’s, where she played a singer who owned an onsen. Wasamin was kinda surprised that I watch Asadora’s, but I told her that I do occasionally watch the current Asadora (Hanbun Aoi) as well. Eventually the queue died down and Wasamin bid us farewell. I headed back home trying to beat the rain, but not before stopping at eCute in Akabane Station and grabbing some good deals on Thai food, including a container of Shrimp in Chili Sauce which got spicier the further down the container you went. I was a bit worried about the next day. How would the weather affect Wasamin’s events??? This is probably my favorite venue to see Wasamin perform in, so I did not want to miss it regardless of the weather. I got to Asakusa a little early and had a quick bite at a Kaitenzushi before heading to the shop. When I arrived they were already calling people in by number. I went to the register and purchased two more copies (Types A and B) I also received a few copies via delivery this morning, do I am developing a little stack. When I paid for my CDs they handed me an entry lottery ticket, which I thou was kinda funny since the seat lottery was already over. But I dutifully went to the staircase, flashed my ticket, and went upstairs. There were plenty of seats available, including two comfy chairs in the 3rd and 4th rows, so I grabbed one of those. Oops, the angle was a little off, but it’s a nice pic. I told Wasamin about my Ebi in Spicy Chili Sauce I had for dinner the previous evening. She asked if I didn’t like spicy food, but I told her I did. I went on to tell her that Mexican food is one of my favorites, since Mexico and California are next to one another. Wasamin told me she really likes spicy food too. With that I told her I would see her tomorrow. What I forgot to tell her was that I would be bringing a friend. After Wednesday evening’s cancelled event due to the storm, Wasamin was back in action Thursday with two events in Tokyo. She started the day with a performance at one of my favorite places to see her, Onkyoku-do in Koiwa. 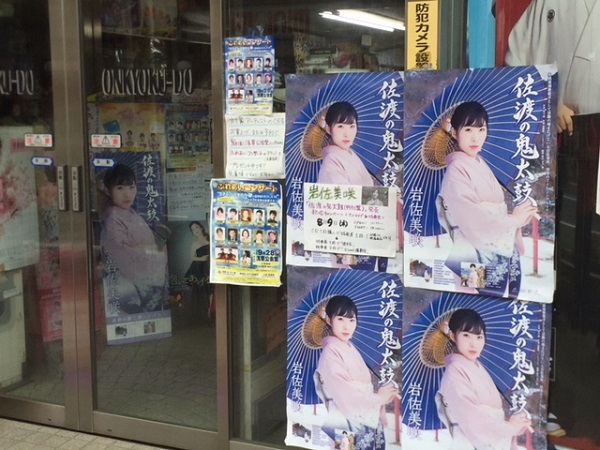 I wrote a paper about old Enka shops in Tokyo; how they are a throwback to old Japanese Pop culture, and their historical significance. 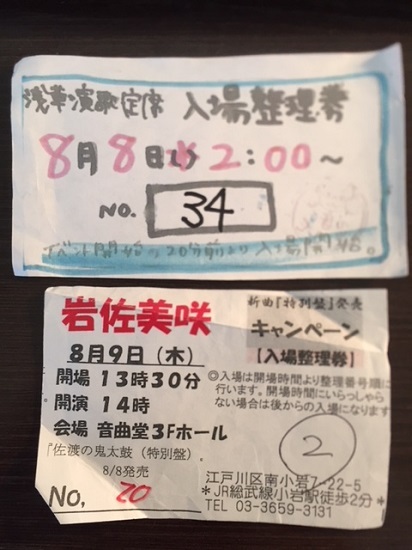 This was one of the five shops I featured (Along with Yoro-do in Asakusa, Music Shop Dan in Higashi-Jujo, Meikyoku-do in Nakano, and Tensei-do in Kameido) I headed out to Koiwa early to get a priority event entry ticket, eat lunch, and meet up with Derek, who was in the mood to watch Wasamin. I turned to Derek when Wasamin announced the 2nd song to tell him this is one of my favorite songs to watch her perform. It has an audience participation part in the verse that’s a lot of fun. However, Derek was most impressed with her rendition of Kaze no Bon Koi Uta. 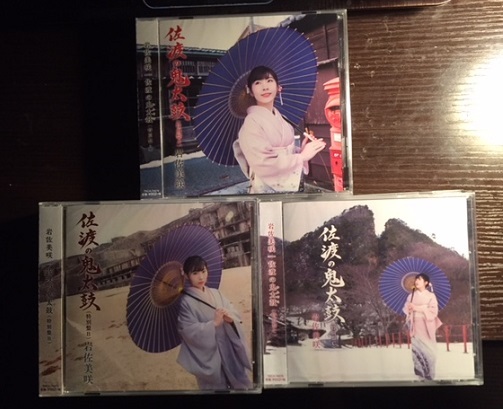 It is the slowest ballad on the new release, but the song showcases Wasamin’s ability to make some difficult vocal transitions, and subtle nuances the song demands. Of all the songs on the CD, it is the one I have heard her perform the least, so it was a nice change of pace. 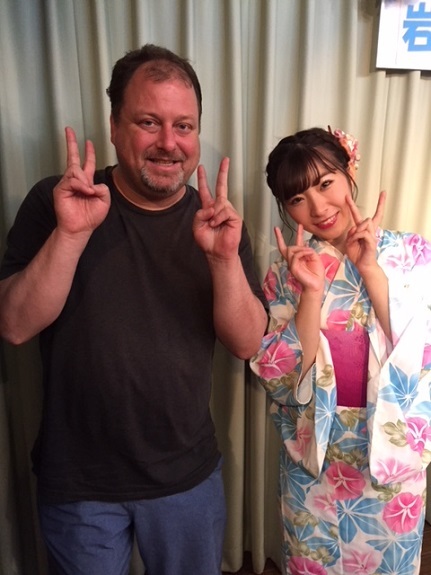 They brought us up for 2-shots/handshakes by row, Wasamin thanked me for bringing Derek to the show. I told her that her old friend Kenji-san from Hong Kong would be arriving on Friday, and I would try to get him to come to the Monday event in Saitama. She asked if I was coming to Saitama. I was already leaning toward going, but since she put me on the spot I committed to my attendance. Although it was a good thing she hadn’t asked my about Friday’s event, since I was still undecided about it, LOL. 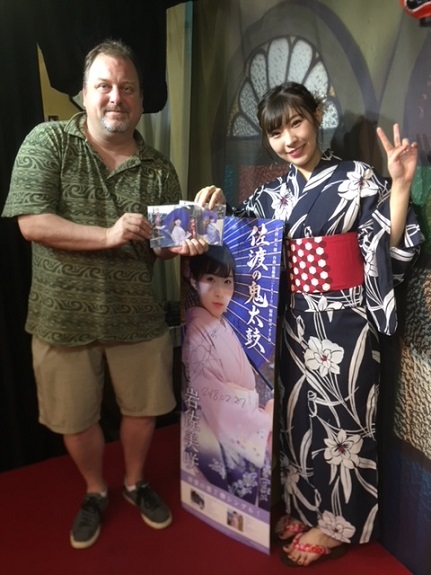 After that, Derek and I caught the Sobu Line to Akihabara, where I had to pick up some of my pre-orders of this single, then we hung out in the Excelsior Caffe, where Derek was still going on about Wasamin’s performance. I related the story to Wasamin about Derek swooning over Wasamin’s performance of Kaze no Bon Koi Uta. In a soft voice, she replied “Honto?” Not to be left out,I told her I also thought it was a beautiful performance. She thanked me, and I was pretty much done, or so I thought. As I was walking away, I noticed everyone in line was staring at me and smiling. I turned around to see Wasamin and the fan behind me in line both looking at me. 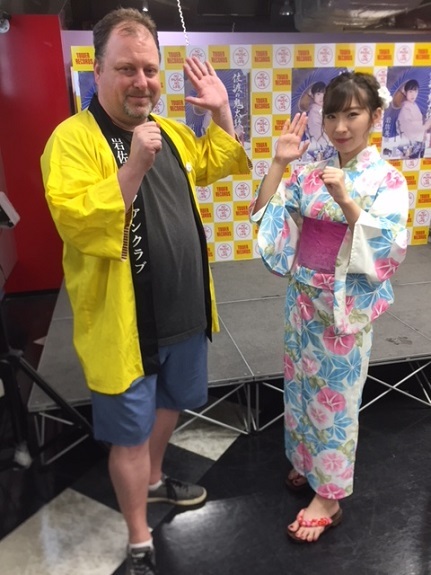 They seemed to be discussing my Japanese ability, Wasamin again saying I have become good at speaking the language Since I always struggle to come up with the appropriate response on the fly, I replied “So desu ka?” which for some reason got a laugh. I loudly exclaimed “Arigatou Misaki-chan!” as I continued to walk away. With that I was done. I could have stuck around until the end, but the line was really long. I decided to call it a night, and grabbed the next bus home. 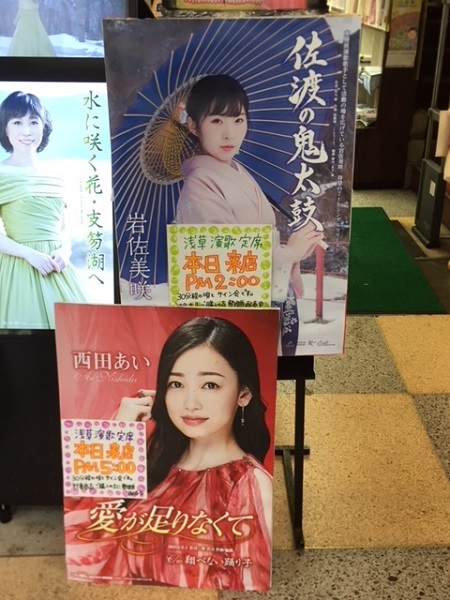 Toay (Friday) Wasamin will be at Moritown in Western Tokyo, before heading to Fukuoka and Hiroshima for the weekend. I was debating going to Friday’s events, considering maybe taking a day off, especially since I am committed to going Monday. But then I remembered that AKB has a handshake event today, and if I don’t go to her event she will assume I went to AKB instead. With that in mind, I think I need to make an appearance. Next Iwasa Misaki 7th Single Re-release Week Promotional Festivities, Part 2 ~Hitting the Road~ Plus, a Couple of Big Wasamin Announcements!